I often wondered what it was about Eva Peron, barely a footnote in world history, that prompted Tim Rice and Andrew Lloyd Webber to write the music and lyrics for the powerful and passionate “Evita,” which has become a modern classic. It is currently being presented by the West Allis Players. Perhaps it was the rags to riches story of the young Eva Duarte, an actress and radio star who married the Argentine political powerhouse Juan Peron in 1945. Perhaps it was Eva’s beauty and charisma, qualities that Peron saw as beneficial to his political aspirations and qualities that captured the hearts of all of Argentina. Maybe it was the political climate and intrigue of Argentina, land of the tango. Or maybe it was because she died so young with so much more of a story to tell … a story that was intriguing even after her death. 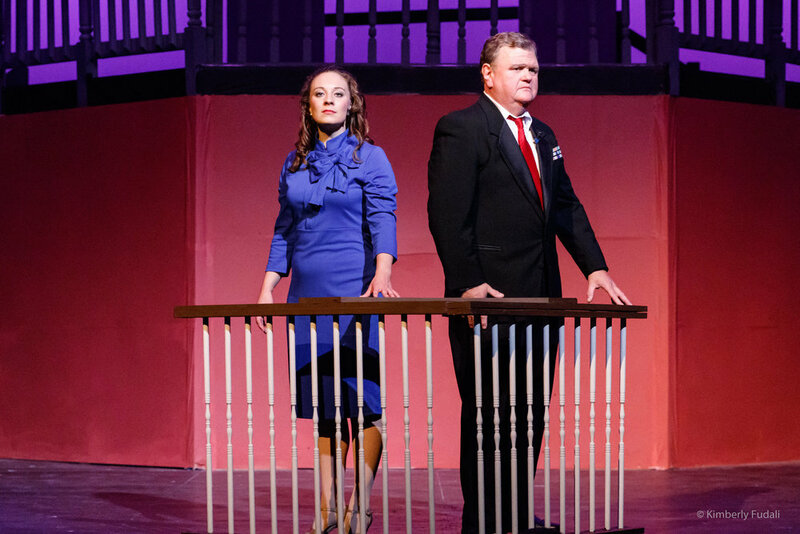 West Allis Players, under the direction of Katherine Beeson, is offering a version with much of the power and passion intended, thanks to the outstanding lead performances of Lindsay Woppert as Eva Peron and Nicholas Callan Haubner as Che, a common man who serves as the narrator. The show is totally sung – there’s no dialogue -- with some of the Rice-Webber duo’s most beautiful music, delivered nicely by the 13-piece orchestra under the direction of Pat Breed Kaiser, who also is the production’s music director. The show opens with the showing of a fuzzy film on the stage’s curtain in what is supposed to be a theater in Buenos Aires in 1952. The movie is interrupted by the news of Eva Peron’s death. Next, a scene of her funeral attended by thousands of her adoring countrymen is shown. The scene moves to the stage, where her body lies among the mourners. Che reacts to the outpouring of affection by raising questions about her motives: self-serving or altruistic? Che is ever present, attacking and questioning Eva, who was known as Evita, throughout. In Act II, Peron becomes president the year after he and Evita married. She sets out to make a name for herself and the new era of Argentina on a world tour, her beauty enhanced by the high fashion outfits she wears. The scene is nicely staged with Evita striding behind two panels, that close behind her, to change into a new stunning outfit. Later, she is criticized for not helping the people, as she promised, and suspected of laundering money given to her charitable foundation. Despite her failing health, Eva wants to be vice-president, a move not favored by the country’s generals. “Why try to govern a country, when you can be a saint?” sings Che. She abandons her ambitions and gives one final broadcast to the people. She dies at age 33. There are lots of highlights here, most delivered by Woppert and Haubner and backed up by the fine orchestra, showcasing Webber’s gorgeous music. Scott Fudali’s handsome simple, uncluttered set and well-conceived lighting serve the production well and showcase the performers. The muted set colors and subtle lighting, plus the large central balcony and side staircases provide a wonderful background for the colorful show. I had seen Woppert several years ago in the lead role of “Evita” and thought she was wonderful then. But this time her characterization has even more depth and her songs are even bolder and more confident. Her “Don’t Cry for Me Argentina” from the balcony is gorgeous. She and Haubner would be a dream pairing for any director of this show. Their “Waltz for Eva and Che” is slick and precise, showcasing how gracefully they move as well as stellar vocals. Kaiser is a capable Juan Peron as is Gregory Malcolm as Augustin Magaldi, a singer who takes Evita to Buenos Aires where her career takes off. Mary Catherine Owen delivers a fine rendition of “Another Suitcase, Another Hall” playing Peron’s mistress, who is supplanted by Evita as the general’s lover. Joseph Krasovich’s choreography is showcased in several numbers and generally performed well especially the lively "And the Money Kept Rolling In" scene, in which Che mocks Evita's charitable endeavors as self-serving . The ensemble has a good look, but perhaps could have reacted more strongly in some scenes—for instance, as the mourners in the opening scene. The entire cast captures the intensity in “A New Argentina” to close Act I. The ensemble could’ve used more sound to balance the large orchestra. Nonetheless, this is a beautifully staged “Evita,” a musical which will remain a classic for years because of its beautiful protagonist, taut story and array of gorgeous music.